I am posting information gleaned from land records in the areas where our family’s ancestors resided. You can read more about this project in the overview. You may also check my deed record listing, which I will update frequently, but probably not every day. This group pertain to Papa’s Fellows ancestors who resided in Wexford County, Michigan. Belle and Charlie lived on this piece of of land when M-in-L was a child. This deed shows why I believe it is important to leave no STONE unturned while researching your family. If you look back at the post I wrote about Charlie Tinker, you can see that Charlie and Belle married on 15 July 1914. Interesting this deed was recorded the same day Charlie and Belle married, apparently in a judge’s chambers at the courthouse. A closer look shows that Lester and Sarah Stone were the witnesses. Oh. Although Charlie Tinker’s obituary gave an earlier year for their marriage, I am convinced that the actual date was 15 July 1914. One little postcard shows how valuable various fragments of evidence can become. 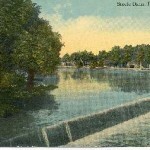 In the collection from Belle’s box, I wrote about a postcard from Mrs. Stone, which was postmarked 31 July 1914. Looks like Belle and Charlie got a dog with the house and property! The location is marked in red from the 1914 atlas of Wexford County1 which is online on a University of Michigan site. 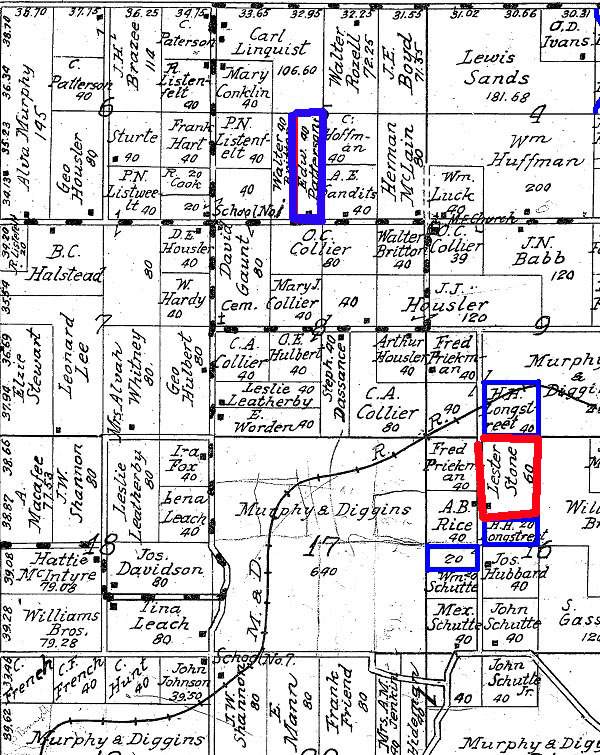 The blue outlined property was owned at various times by people associated with Belle. The northern most property was owned by Alfred Fenton, a brother-in-law of Belle’s daughter, Edna. 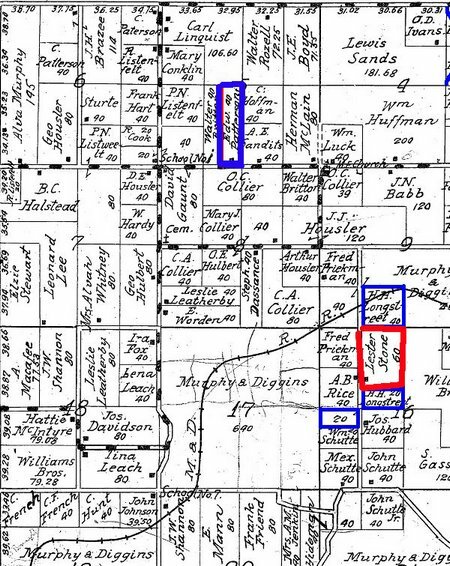 Edna’s mother-in-law, Susie M. Burdick Fenton Longstreet and her husband Harmon H. Longstreet owned the remaining property outlined in blue. Standard Map Company., Atlas of Wexford County, Michigan : containing complete maps of all townships, names of property owners, maps of the county, city of Cadillac, United States and State of Michigan., Standard Map Company., Cadillac Evening News (Firm) (Cadillac, Mich.: Cadillac Evening News, c1914), page 20, The University of Michigan. 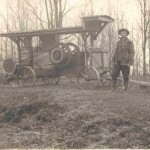 Michigan County Histories and Atlases. http://name.umdl.umich.edu/3928167.0001.001 : accessed 2 November 2009. It is very interesting that they purchased the land from the Stone’s and that the Stone’s were their witnesses. Makes you wonder if the wedding was planned or spur of the moment. .-= Apple´s last blog ..Sarah Ann Wisner Camfield – Marriage, Children and Migration =-. I don’t know if there was a wait between the license and the marriage back then, or not. But, the courthouse would have been about 12 miles, and the events were on the same day. Looks like killing two birds with one stone to me.